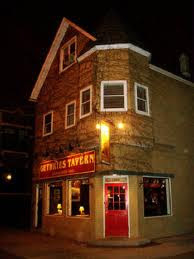 Guthries is a neighborhood tavern located at Lakewood and Addison on the western edge of Wrigleyville. If you know anything about Chicago you know that corner bars are a dime a dozen, but you won’t find any crusty patrons that you suspect have been saddled up along the bar since first call at Guthries. The local establishment served as a grocery store during prohibition but has been a bar since 1933. Gutheries is named for J.B. Guthrie, a prominent developer in Lakeview in the late 1800’s. The two-story, gabled building features a beige-painted brick and wooden façade with "Tavern" tastefully stenciled in red on both of its large picture windows overlooking the sidewalk. There are free pretzels, beers that range from Chimay to the blue collared Old Style and a bookcase of board games to play in the relaxed atmosphere. I lived about two blocks from Guthries when I lived in Wrigleyville, so I’ve been there more than a few times. I picked it as the place where Libby and Aidan have their initial showdown in BINDING ARBITRATION, one, because of the location near the ballpark; two, because it’s a place where people “play games” and three, because it holds a special place in my heart. It’s not a fancy place but it holds a certain kind of rustic charm. I lived with my boyfriend and on the afternoon of the day I got engaged he called me and told me to meet him at 5 p.m. at Guthries. I had a feeling that we were going to get engaged and I didn’t think he’d do it in Guthries, but it was one of the first places we’d ever gone to together so I was like, “okay”. I got to the bar to find it fairly empty on an early Saturday evening the week before Christmas. My boyfriend told me to wear something nice, so I was way overdressed, sitting at the bar alone. Of course a guy approached me. Let me say that I think this was the first and only time I’d ever walked into a bar alone. Bar guy sat down next to me and kept trying to have a conversation with me. I was giving him one syllable answers and watching the door. “I’m not interested,” I retorted. “Sure you are.” He grinned. Next thing I know, my boyfriend, all six-foot-five inches of him, walks through the door. I smiled at him and then I looked back at bar guy. He chuckled and slinked away as my boyfriend approached. Then I patted-down my boyfriend and his trench coat. No ring! So the next time you go to a Cubs game, stop by Guthries for a beer, a game of Life and maybe a memory or two. Guthries 1300 West Addison, Chicago, Illlinois was voted Top 10 Chicago, Neighborhood Bars, Eyewitness Top 10 Travel Guides!